Have you ever tried something that was almost good and knew immediately that it could be great? I have…many times. A few days back Hubby and I stopped by Whole Foods to grab a few things, and wandered into their soup-bar section. Some of the smells coming from soups were amazing, while others not so much. 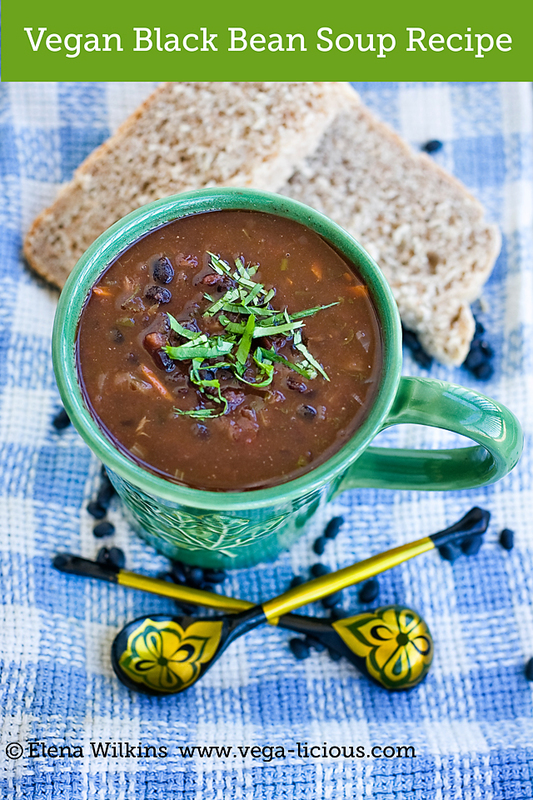 After checking out a few options I made my way to a pot of Adobo Black Bean Soup. It smelt divine. I asked their friendly staff for a taste–it was good. I wanted some! However, I wanted better ingredients and an improvement on the taste of what I had. I wanted to take what they had and make it better. $4.00 later I was munching on a small cup of soup. However, the more I had of it, the more I was turned off by its sweetness–a couple of culprits responsible for that were molasses and sugar=YUCK! Adding sugar to soups should be illegal. (Not to mention that combining beans and sugar put me at a risk of experiencing a “gas attack”–when high fiber food, such as beans, is combined with simple sugars, such an outcome is unavoidable!). The soup was also a bit too spicy for my taste. *it does not take 3 hours to make the soup–the time was spent preparing everything, getting ingredients ready and taking care of life in between. Pre-soak beans overnight and rinse before cooking. If you don't have time to pre-soak them, it will increase cooking time, but make sure to wash them thoroughly before cooking anyway. Pour 10 cups of water into a large cooking pot, add beans, salt and bay leaves and bring to boil. Add tomatoes and remaining 2 cups of water. Add: soy sauce, salt, chili powder, cayenne pepper and cumin powder, and continue cooking. Meanwhile, preheat a skillet on medium heat, add remaining ingredients: onions, carrots, celery and bell pepper. When you hear them sizzle, use ¼ cup of water, splashing as needed, to sauté. Bring to medium-high heat, sauté, stirring, for 1-2 minutes, reduce heat to medium and sauté for another 5 minutes. Remove ingredients from the skillet and add to boiling soup. Cover cooking pot, reduce heat to low and continue cooking for another 20-30 minutes. *pre-soaking, boiling beans with bay leaves, and removing white foam off the top, while boiling occurs--all reduce the "gas" effect of beans. Enjoy! 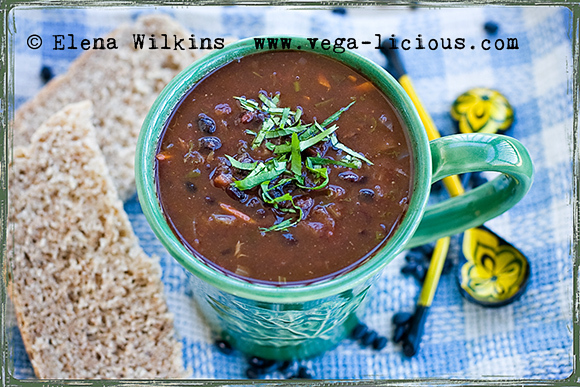 Soup is at it’s best after sitting for a few hours or overnight, and when served with whole wheat homemade bread, and possibly a spoonful of vegan sour cream. Mmmmmmmmmm!!!!!! GOOD! If you make the soup, let me know what you think. Adjust ingredient quantities as needed. Cookware: I cook my meals in my favorite World’s Finest 7-ply cookware set. Compare it to compatible products sold at only private demos (I have been to those too!) that would cost you thousands of dollars more. This is a winner! I’ve had my set for over 9 years now and love it! Enjoy the recipe, and make sure to share it with other via social share buttons around this recipe. Let’s make this world a healthier place one delicious spoonful of soup at a time.